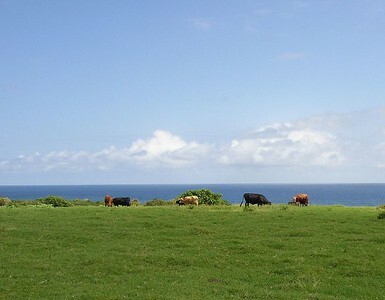 Cows like an ocean view too. 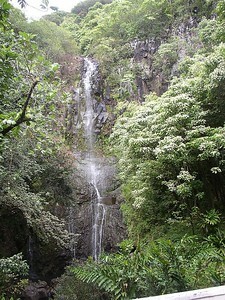 Unnamed falls on the side of the road after Hana. 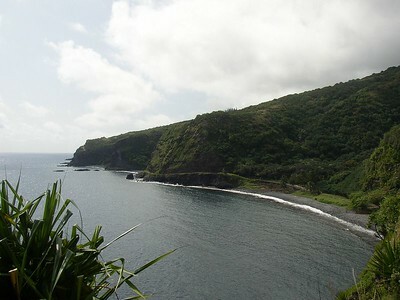 Ohe'o Gulch, minus the peeps. 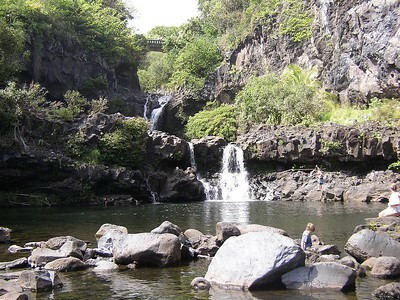 Ohe'o Gulch aka Seven Sacred Pools. 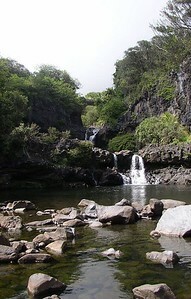 Though I don't think there are really 7 pools, or anything sacred here, for that matter. 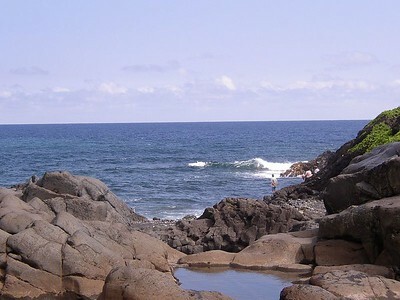 It's still a lovely spot for a swim, with views of the ocean behind me. 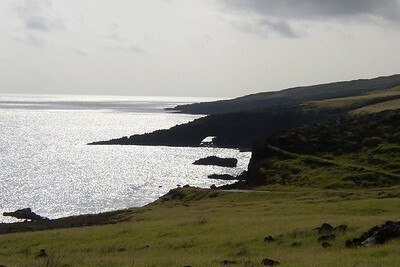 Ocean view from Ohe'o Gulch. View of the Pacific on the trail to Ohe'o Gulch back to the car. 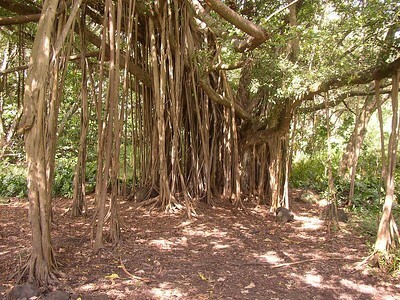 This is a banyan tree along the trail in the park at Ohe'o Gulch. And yes, it's all one tree. It has numerous aerial roots that grow down from the branches and take root in the soil to form prop roots or secondary trunks. 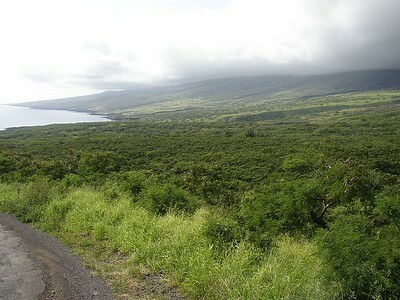 View of the Pacific from Hwy 31(I'm not sure we call it the Hana Hwy anymore since we're well past Hana at this point). 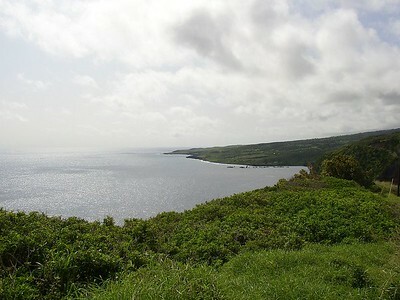 You can see the highway continuing along the coast below. Yep, that's it again. The Pacific. From the same road too. How 'bout that? 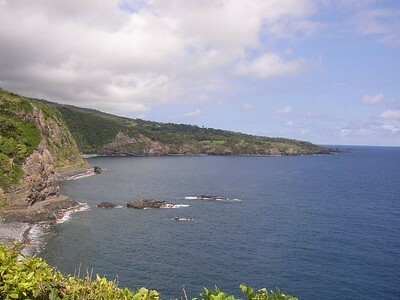 The Pacific Ocean, with views of Kaupo Gap sweeping up towards Haleakala. Yep. There it is. The Pacific again. I just couldn't get over the awesomeness of it all. And the contrast of greens and blues. Wow! Time for one more shot of the Jeep. 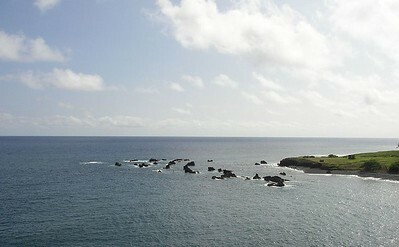 Mokulau or "many islets". 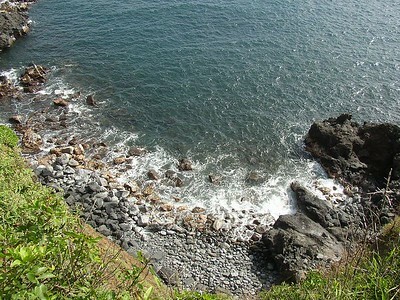 These are lava outcroppings in the water. Kind of a long way down. But dramatic none the less. 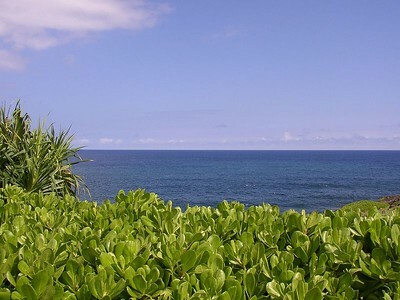 Green cliffs, brilliant blue skies with puffy white clouds, deep blue ocean. Aaah. 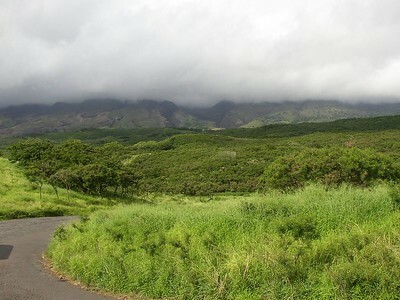 A closer, more dramatic view of Kaupo Gap, with clouds rolling down off Haleakala. 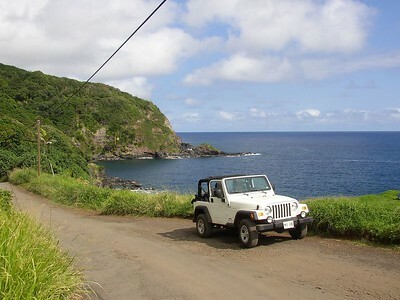 The road from Hana around through southeast Maui is a little rough. I'm not sure which was worse, the dirt/gravel road before, or this patchwork of asphalt. But there's absolutely nothing along this road for miles. So I guess it's not a big priority for the paving crew. And yes, everything is really this green. 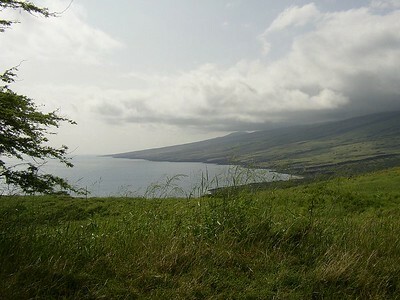 This side of the island is newer than the east side and there's lava rock sticking up everywhere. Perhaps that's why everything's so green. 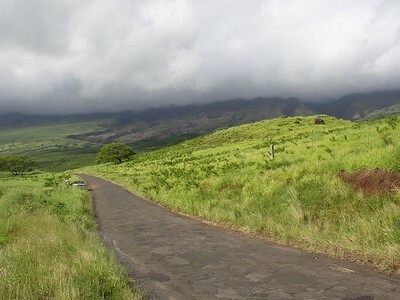 Another view of the south side of Haleakala. 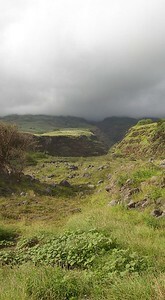 An unnamed gap down the side of Haleakala. 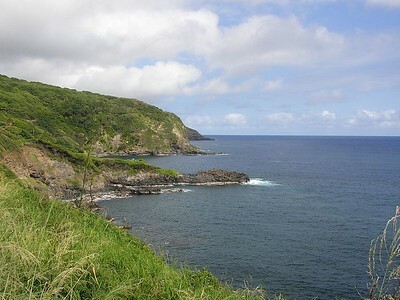 Huakini Bay and the Pokowai Sea Arch beyond. 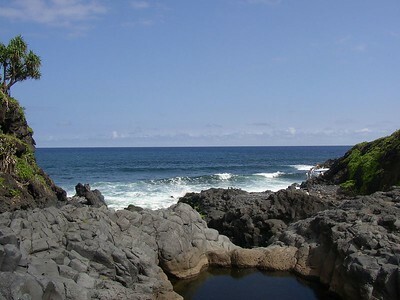 The sea arch is all that remains of an old lava tube. Cool, huh? This awesome gulch shows the layers of different lava flows over time. How cool is that? Oh, and the bridge is two-lane. Did I mention this section of road is all one-lane? 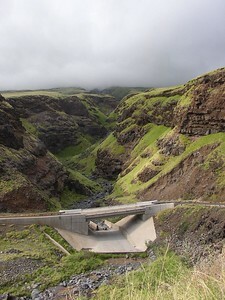 Yeah, apparently the government won't pay for one-lane bridges, so you get a two-lane bridge whether ya' need it or not. Nothing but shrubs and grass over here. 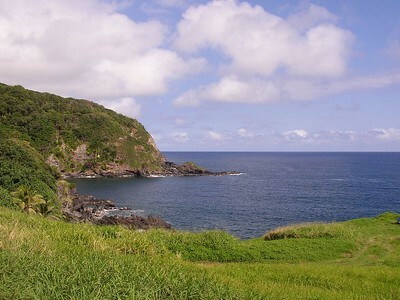 Apparently there are a few people trying to homestead out on this side of the island, but it's so remote they're doing so without electricity or running water. 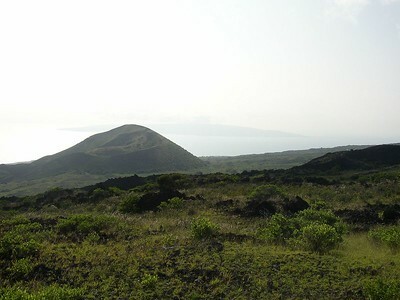 If you look really hard, off in the distance you can just make out the uninhabited island of Kaho'olawe.